So I have heard this concept over and over about “staying in the zone” especially during cardio workouts. What is my zone? The “what in the hell are you making me do and my heart is now pounding in my head making me feel like my ears about about the burs” zone? So I wanted to find out what is my optimum heart rate so I can compare it to how I feel during workouts.Go to your WOWY Super Gym™ and under Fitness Tools you will find Target Hart Rate Calculator. 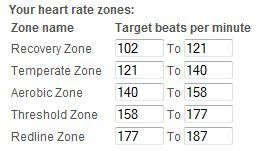 From what I read the consensus is that the target heart rate zone should be 50% to 85% of your max heart rate. What is max heart rate? That split second before I drop dead? (not on a chart) really means that I can still make rational decisions…You should know yours especially when pushing yourself past the zone of comfort during cardio intensive activity. I hope to improve this over time and keep my ticker running…you just never know when you might need it.